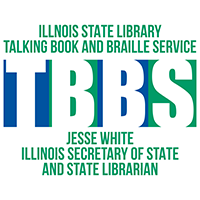 The Talking Book and Braille Service (TBBS) provides audio and braille library service via mail or digital download to any Illinois resident who is unable to read standard print material due to a permanent or temporary visual or physical disability. TBBS has genealogy resources. The Office of the Illinois Secretary of State website says that Reaching Across Illinois Library System (RAILS) and Illinois Heartland Library System (IHLS) have consolidated their TBBS services with the Illinois State Library. The location of the talking book library has changed, but patrons will continue to receive exceptional TBBS service and support. The News Gazette reported that TBBS has over 84,000 talking books available as well as 15,400 Braille books. In order to play talking books, the National Library Service for the Blind and Physically Handicapped provides free audio book players to active patrons. A quick search of TBBS for the word “genealogy” brought up 187 results. Each book has a brief description and a notation about its status. Some talking books are downloadable. Some are listed as “download or special order only”. Others require you to call the library in order to access them. Some are in Braille.